Lunch is a oven roasted deli turkey & cheese sandwich on a Hawaiian sweet bun. Beside it are organic baby carrots & celery. Top left is mandarin oranges. Top right is apple & biscoff spread sandwiches. 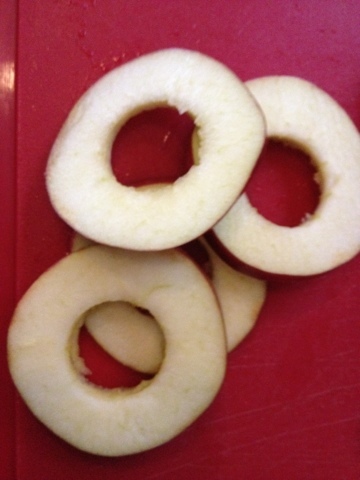 For the "apple sandwiches", I sliced the apples and cut out the cores. Spread on our biscoff spread and sandwiched two of them. Biscoff is so delicious on apples! Since it's made of biscoff cookies and has a caramel taste. Yum! It's Little Miss's (and my) new favorite way to eat Biscoff. For those wondering, Biscoff Spread is is Europe's alternative to Peanut Butter - NUT FREE, contains no artificial colors, flavors or preservatives, and it's vegan. The main ingredient is Biscoff Cookies. 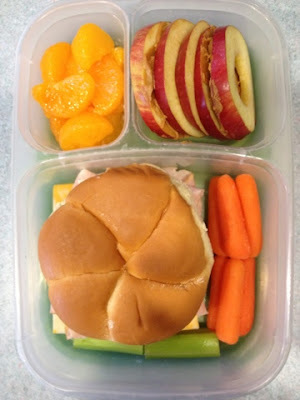 Love the apple sandwiches. I pinned those last week! Sooo cute and soooo healthy! Maybe that will be the trick to get Little D to eat the skins :) Boom! Ooo yay! Another way to eat Biscoff :D I can't wait to try it on apples!! Colorful lunch and love the apple sandwiches.